Anita Yuen, Julian Cheung, Calvin Choy, Raymond Wong, Stephen Shiu Jr.
Julian Cheung Chi Lam two nights ago worked on his new film S STORM (S FUNG BO) with Louis Koo Tin Lok, Ada Choi Siu Fun, DaDa Chan Jing and Derek Tsang Kwok Cheung. 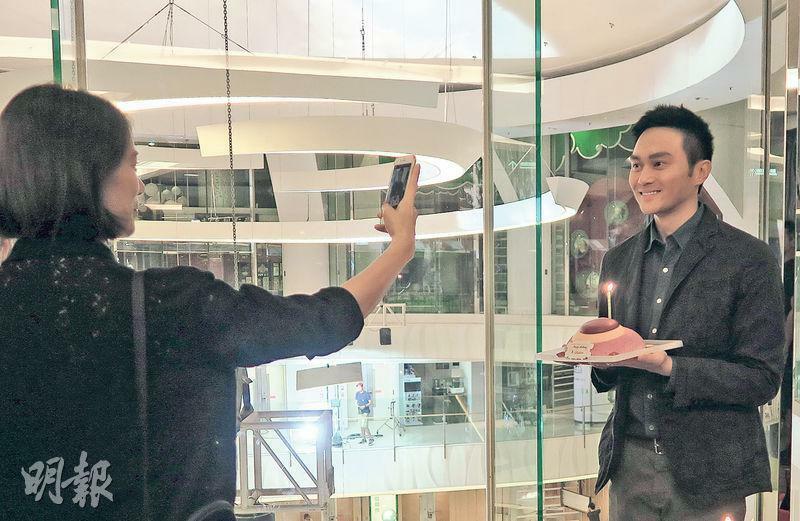 The team surprised Chilam with a S shaped cake for his August 27th birthday. 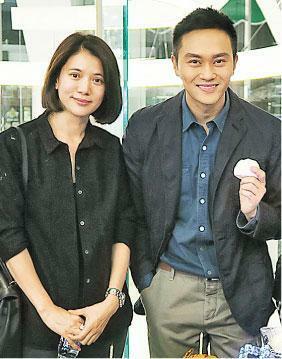 Chilam's wife Anita Yuen Wing Yi, friend Calvin Choy Yat Chi, Pegasus Motion Pictures boss Raymond Wong Pak Ming and manager Stephen Shiu Jr. brought birthday buns, mahjong shaped cake and snacks. 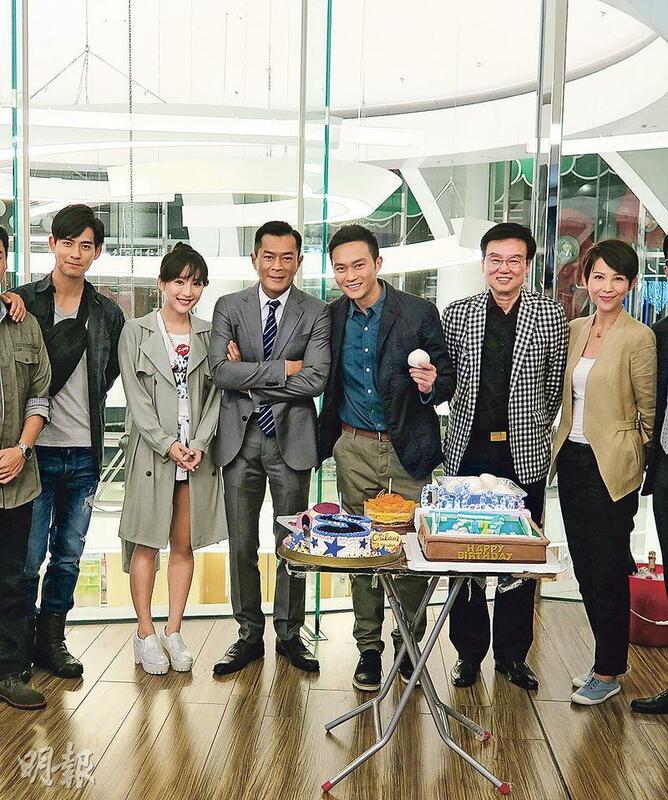 Around 11PM they gradually arrived on the set to prepare to celebrate with Chilam. Birthday boy Chilam around midnight arrived. Choy Yat Chi led everyone in a rendition of the birthday song. Chilam put his hands together in appreciation then cut 4 cakes. However because he had to work he only opened bottles of champagne without enjoying any. When Chi Lam opened a bottle, everyone worried that he would spray them with it and kept telling him not to shake the champagne. Chilam mischievously pretended to shake and everyone ran for napkins. Chilam pretended to be calm when his friends surprised him. "They didn't come to celebrate with him, they came to 'scare' me! (What about Len Len?) Her appearance wasn't surprising at all, because I was the one who told her to keep me company on the set! Every night we start work in the middle of the night and we shut down at sunrise. Since it's my birthday, of course I want her to spend it with me! (What was your birthday wish?) World peace, everyone's lives are happy, S STORM will be a hit. This time working with Koo Tin Lok, Chou Yu Man (Vic), Choi Siu Fun, Chan Jing has been very pleasant. Everyone is an experienced actor with acting skills." At the surprise party, Wong Pak Ming, Stephen Shiu Jr. and Choy Yat Chi all wore black and white checkered clothing. Chilam said that they had quite a connection and he had to take a photo with them. They explained that they only wore the same style checkered clothes for Chilam.